January | 2012 | Platinum Age Comics! Alan Scott, locomotive engineer/train operator, is the sole survivor of a train derailment. Moments before the crash, the train was struck with what appears to be a meteor. It is, in fact, The Starheart, an otherworldly gem containing the spiritual fragments of The Twelve Facets of Gemworld–the legendary creators of that world. The resulting explosion destroyed the Starheart, forcing the fragments to seek a new host. They chose Alan Scott. In the blink of an eye, he found himself transported to the mysterious land of Gemworld where he was discovered and rescued from the train wreckage by a young woman–who he would later discover was actually another survivor from the crash–Amy Winston, AKA Amethyst, Princess of Gemworld. Between Winick’s “Under the Hood” and its film adaptation, Grant Morrison’s “Revenge of the Red Hood” storyline in Batman and Robin, and Winick’s “Lost Days” mini-series, a Red Hood series has been a long time coming. Jason is an extremely compelling character, he has a sizeable fan base, and he’s a badass anti-hero with twin red pistols, just waiting to take back the anti-hero niche in market (he’s Daredevil, the Punisher, Wolverine, Daken, and Venom rolled up into one guy who was trained by the goddamned BATMAN). When DC came out with The New 52, Red Hood should have been a title selling at least 90k. Instead, we get Red Hood and the Outlaws, debuting at a respectable 65k but now down to 39k. Instead of a book bordering on Batman-meets-Boondock Saints, we got a book so contrary to the highlights of Jason’s character—ancient magic zombie sensei, say what?—that it really feels like it could have been about…anyone. It’s not bad—39,000 people might even say it’s good—but that doesn’t change the fact that it should have been great. It should and could have been a breakout hit: the birth of a new franchise in its own right. My intent is not to discredit the current creative team but to suggest a more financially profitable and hagiologically rewarding alternative. First and foremost, Jason is a redhead. Bruce is WASPy, Grayson is Romani, and Tim is also pretty WASPy, and it all adds up to every Robin having black hair. Jason having red/blonde hair works perfectly to signal him as something slightly apart (the red headed step-child) and the fact that he used to dye it black to look more like Grayson just works so well with his character and his relationship with Bruce that I hate to see it forgotten. 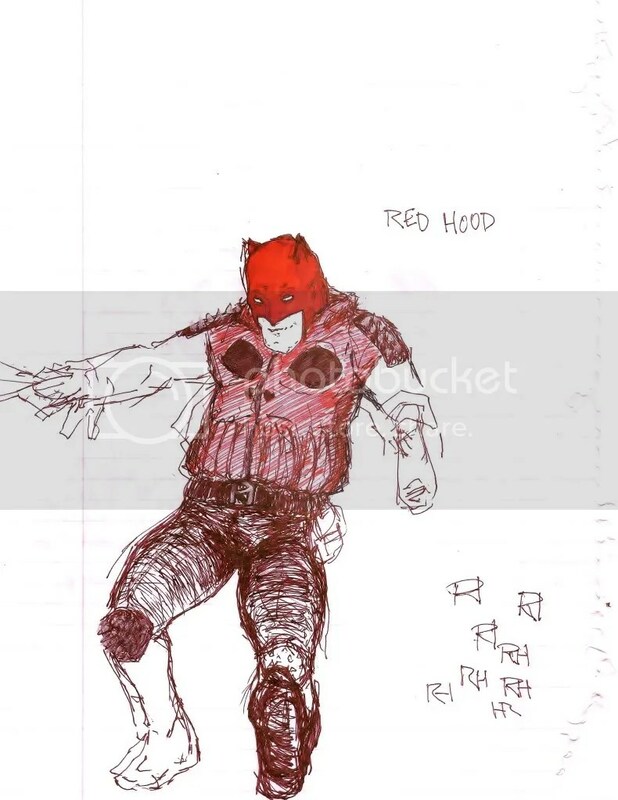 Then there’s the matter of his being the Red Hood and all, so his red hair works there, as well—almost like a predetermination of his character arc. The red also works well with the fact that the Joker, his pater mortis, beat his brains out—and the fact that only Barbara Gordon/Batgirl, another redhead, received equally harsh treatment. The Joker hates redheads? Also, Todd is an Irish surname; so let’s take advantage of that by making Jason not just kind of Irish but extremely Irish: his father was first generation Irish-American and most of his extended family is still located in Ireland. This way, he has a place to build something for himself outside of Gotham while retaining a sense of personal history—for example, his ancestor, “The Flying Todd”, a Robin Hood-esque who mounted a private war against corrupt landlords during the Great Famine. Jason could never work in Gotham, not with Batman around, and for him to work outside of Gotham it would have to be somewhere low key. Ireland is a good starting point and home base, but his adventures will take him global. As far as his mission statement is concerned, Jason will have taken the next natural step in his development. Jason, the child soldier raised from the dead, will shift his concerns from the egotistical (proving his methods to the Bat-Family) to the universal (allowing his methods to speak for themselves). No longer a spirit of his own vengeance, he will embrace his role as a protector of the world’s innocents, staining his hands with blood so they won’t have to. Batman couldn’t prevent the Red Hood, but the Red Hood could have prevented Batman. The Red Hood kills the killers. The series would pick up right where Morrison left it. During the chaos of Professor Pyg’s escape from Blackgate Prison, Jason will also have escaped. He will have returned to the sewers—as in Battle for the Cowl—emptying one of his previous bases before hitting the road. When the series opens, Jason will already be operating in South America, tracking down a lead to the rogue Flamingo. Jason has vowed to rid the world of its deadliest and most sadistic killers. He’s decided to let The Joker be Batman’s problem, letting the responsibility of each victim fall squarely on Batman, while employing his own methods to more effective ends around the world. The major themes of the series will be trace—the inability to escape the past entirely, no matter how many bodies you bury it beneath; revenge versus retribution—acting out of self-interest or out of interest for the greater good; and the dynamic of nature versus nurture—can man be anything more than the product of his circumstances? 1/ A young Jason (red hair) stealing the tires from the Bat-Mobile and Batman catching him doing it. 2/ In the Bat-Cave, Batman (sans cowl) in the middle of training Jason. 3/ Jason as Robin–his hair now black, except for a single red streak. 4/ The Joker swinging a bloody crowbar, from Jason’s POV. Black and White, except for the blood and Joker’s green hair. 5/ Batman cradling Jason’s body. CAPTION: A Death in the Family. 2/ Jason rising up from the Lazarus Pit, as if waking from a nightmare. Ra’s al Ghul and Talia stand over him, looking down. Jason’s hair is now back to red, but the previous streak is now Lazarus green. 3/ Jason training with Ra’s al Ghul and the League of Assassins. Directly mimics the panel of him training with Bruce. 4/ Ra’s sitting on a throne. Talia is to his left. Jason, in LoA gear, to his right. CAPTION: His Red Right Hand. 5/ Talia pushes Jason off a cliff’s edge. Her words/speech balloon follows him as he falls. 6/ Jason, in his gear from Under the Hood, looks up at the Gotham skyline from the river’s edge/harbor. 1/ Jason, beating the Joker with a crowbar. Again, the panel is in black and white, except for the red of Jason’s hood/helmet and the blood, and the green of The Joker’s hair and Jason’s eyes. 2/ Crime Alley. Batman punches Jason to the ground, cop lights in the background getting nearer. 3/ Jason and Sasha from Morrison’s arc, staring down Batman (Grayson) and Robin (Damian). 5/ Jason in his new costume, riding on a motorcycle on a long stretch of highway in Mexico. 6/ A series of photos being taken by Jason of a priest with a young boy as they enter a cathedral. A figure in monk’s robes–the hood is red, as are his slightly visible boots–standing in front of the Cathedral doors. He’s in the middle of posting up a wanted sign of the priest (Wanted: Dead, not Alive)–a la Martin Luther. 1/ Interior of cathedral. Priest is in the middle of a prayer. We see the church from behind the pew (from over the priest’s shoulder). Three knocks at the door interrupt him mid-speech. 2/ The front doors swing open. A silhouetted figure in robes and a hood stands in the open doorway, the sun shining in from behind him. 3/ The doors close behind him. We see the figure is wearing priestly robes, his face covered by the hood. 4/ Close up on red combat boots (like the Pope’s red slippers, yo). 5/ Close up: we see the lower half of the figure’s face. He’s smirking. His left hand is at his hood, readying to remove it. 6/ Close up: from his right sleeve, the tip of a red gun emerges. 1/ The Red Hood stands revealed. Between his helmet and the priestly robes, it’s as if the Devil just entered the church. His right hand is raised, ruby red gun in hand, aimed at the priest. 2/ Jason pulls the trigger. 3/ Close up of priest’s face, a bullet hole in-between his eyes. His eyes are rolling back. Behind him a stained glass window of the Virgin Mary and Christ shatters. Ted Grant (Wildcat) as former Meta-Weight champion, Casino owner, and owner/host of Meta-Martial Arts Presents. His illegitimate son, Tomas Bronson Ramirez (Tomcat), arrives on the Las Vegas MMA scene looking to take the title for himself. TED GRANT (WILDCAT): Mid-40s, former Meta-Weight Champion of the World, and owner of the WILDCAT hotel-casino. Batman and Death. When Bruce’s parents were gunned down in front of him he suffered his first ego death. The safety of Mother and Father—of the triadic family—was taken, the bonds snapped, pearls spilled on blood and concrete. The Red and The Black. No more pearly-white necklace—no more of mommy’s smile—no more mommy—no more love—no more light in the world, only the Red and the Black. Life in Sin or Life in Death, the boy chose an alternative. Art, the axis of meaning and the meaningless, would be his parents’ departing gift: Alfred Pennyworth. The Bell. A vibration across time and space signifying something in the absence of anything: the cry of a bat, directing it through the darkest of night. A former stage-actor and secret agent, richly cultured, Alfred would serve as Bruce’s mentor in the theatric paradigm he assumed on that night in crime alley. Batman. Robin. The Joker. Catwoman. Pop-Crime! Bruce’s life was transformed into an operatic tour de force—an archetypal spectacle performed on the World’s Stage. Bruce had been through the ultimate childhood tragedy and survived, making everything afterwards seem comic by comparison. And so life became a game. A mission. A goal. In The Red of rage and revenge, Bruce became his obsession. He became his desire to become the ultimate man, beginning a years-long journey to become perfect in mind, body, and soul. He became The Best in revenge against Life’s worst: Bruce Wayne to Life’s Joe Chills. But that wasn’t enough. The horror of Life wasn’t just that everything dies, but that some things kill. Life necessitates death, but life could never necessitate murder, not for Bruce. To right a wrong with another wrong—or to seek Red in response to Black—is to perpetuate the cycle and, in doing so, become it. Face to face with Joe Chill, he was forced to overcome his bloodlust—to show compassion. The Red was not enough. But the Black… Draped in the shadows of mythology and spectacle, Bruce showed Gotham darkness darker than its own: a darkness that, in rejecting the ego-satisfaction of lex talionis revenge, brought order into a world of chaos. The darkness could be good too. If Bruce Wayne was the response the criminals of Gotham expected, Batman was the response they deserved. An avatar of Death that doesn’t kill—that’s Batman. ALFRED PENNYWORTH: Alfred Pennyworth, a.k.a. Alfred Beagle, a.k.a. The Eagle. The son of Jarvis Pennyworth, the formerly sole surviving member of the Pennyworth Fraternity, Alfred was raised, along with his brothers, as the last generation of the once most pervasive secret society in the United Kingdom. JULIA REMARQUE: Julia Remarque, a.k.a. Pennyworth, a.k.a. The Sparrow. The biological daughter of Alfred Pennyworth and former Mademoiselle Marie, Anais Guillot, she was raised in secrecy by her uncle, Jacques Remarque, to assassinate the surviving members of Black Sol. MADEMOISELLE MARIE: Anais Guillot, a.k.a. Marie Beagle, a.k.a. The Man. Following the death of her father, Mathieu Guillot, Anais came under the care of her godfather, MI6 Agent Jarvis Pennyworth, and was raised alongside his family. Inherited the title of Mademoiselle Marie while running missions for the French secret service. On-again-off-again relationship with Alfred Pennyworth, they share a daughter, Julia Remarque, unbeknownst to Alfred. 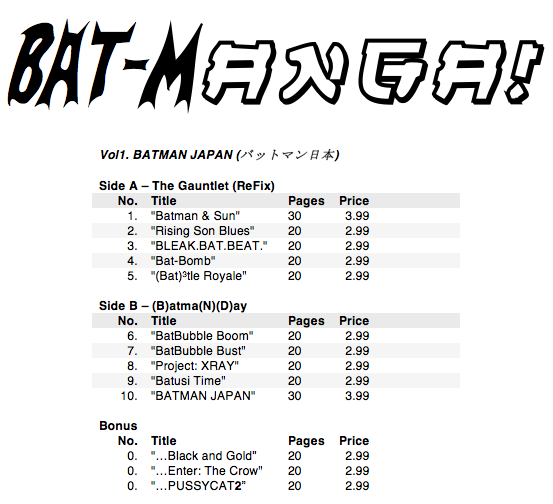 – JIRO OSAMU: Batman Japan. Manga shop owner. Former student of crime-fighter Mr. Unknown. – DAISUKE YAGAMI: Jiro’s best friend since childhood, and the only one who knows he’s Batman Japan. – MISAKI HASEGAWA: Jiro’s ex-girlfriend and the daughter of his former sensei, Mr. Unknown. Attending The University of Tokyo. – CASSANDRA WU SONG-CAIN: Black Bat, daughter of the world’s deadliest assassins, and a former Batgirl. – STEPHANIE BROWN: Gold Bat, daughter of unrepentant criminal, and (also) a former Batgirl. – HIRO OKAMURA: Thirteen year-old genius, engineering professor at the University of Tokyo. – VINCENTE BARBOSA: The Crow, a Japanese-Brazilian entrepreneur with a love for industrial espionage. – KAKALINA “KITTY” KATO: Beckoning Cat, a Japanese pop star turned vigilante, and twin-sister of the villainous Forked Cat (Tabby Kato). – MR. MUJINA: No Face (“the Japanese Clayface”) is a faceless pimp who prostitutes pieces of himself, The Claydolls; he is protected by his golem, Dogu. – KAPIKA “TABBY” KATO: Forked Cat, the undead sister of Kitty Kato; loyal devotee of the undying Lord Death Man. – RASHOMON: A baby orphaned at a playground near the remnants of Kyoto’s ancient gate, Rashomon, channels the psychical energies of every corpse and unwanted baby ever abandoned at the gate. – RED CLAW: Red Claw, wealthy heiress, and Japan’s #1 assassin. – BRUSHOGUN: Brushogun, a man with the ability to paint things into life via his ink-brush spear, Irezumi. The symbol of the Bat has taken hold of Japan, and not everyone is happy about that.